Amit is the owner and principal dentist here at City Dental Practice. 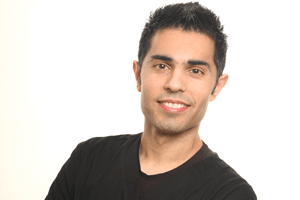 Any treatments or dental work that you have with us will be carried out by Amit personally. Caring for your teeth is what Amit is passionate about, and this is reflected in the high standards of work he constantly delivers. Most of Amit’s time in practice is spent treating patients, which he enjoys a lot. However, his favourite thing about his job is that it allows him to get to know and build relationships not only with his patients, but with the staff who work alongside him too. Outside of work Amit enjoys spending time with his two children Aaron and Arya. He occasionally gets a chance to socialise with his friends, but only once he has completed all the chores that his wife Leila has set him. 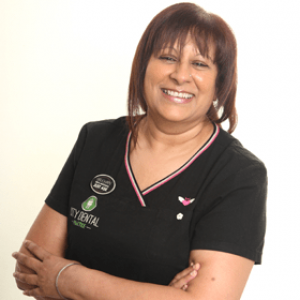 Marian is one of our great dental nurses at City Dental Practice and having been here for 14 years she is a knowledgeable member of the team. Her bright and bubbly personality makes the practice not only a fantastic place to have your oral health tended to, but also an enjoyable place to work. On a day to day basis Marian’s primary role is to assist Amit in ensuring every patient receives exemplary dental care. When Marian is not working alongside Amit she finds the time to organise and run our specially made decontamination room. The main thing that Marian enjoys about her job is the satisfaction she gets from seeing a patient leave the practice with a beautiful smile on their face. Away from the practice Marian likes to bake, read and take long walks. She is also partial to a good ole singsong, which we’re sure her neighbours are ecstatic about. As well as cooking and singing Marian enjoys spending time with her husband Tony, they are regular visitors to Ireland as that is where Marian’s family are originally from. 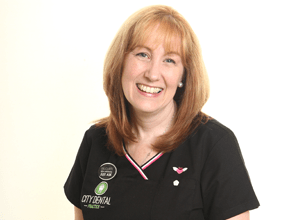 Pam is a key part of the team here at City Dental Practice as not only is she a qualified dental nurse, she is also head of our reception. Pam has been with the practice for nearly 30 years which means she has a wealth of experience and knowledge to offer our patients and also other member of staff. Each day Pam is responsible for booking appointments, greeting patients and ensuring that the practice runs smoothly. She also assists Amit with some dental procedures and helps keep the decontamination room in top shape. Pam’s favourite thing about her job is having the opportunity to meet the patients at the start of their dental journey. She also likes being able to know that she is a part of a team that is helping the local community. When she’s not at work Pam enjoys cooking, going to the gym and listening to music – we’ve checked her iPod on multiple occasions and One Direction is always top of her recently played. Family is also very important to Pam so she tries to spend as much time as possible with all of her nieces and nephews. If you’re looking for a new dentist in Birmingham, please consider City Dental Practice.If you would like to book an appointment or to speak to our team about a cosmetic treatment please just give our team a call on 0121 455 9233.